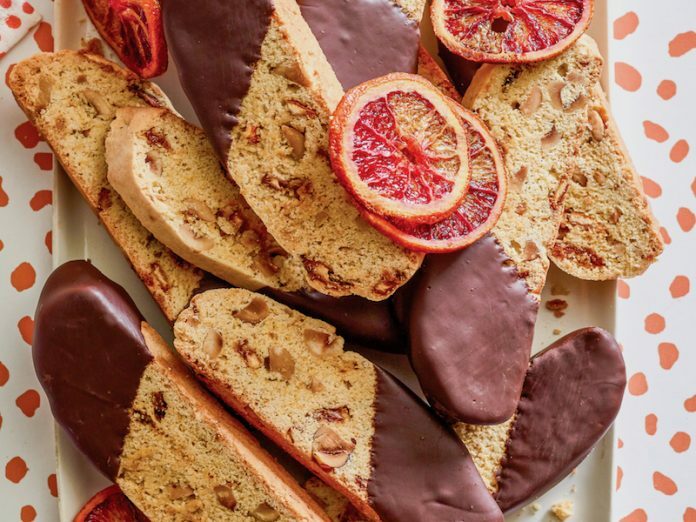 These Roasted Blood Orange Hazelnut Biscotti by Marian Cooper Cairns take the classic pairing of chocolate and citrus to the next level. Sliced-up fresh blood oranges are tossed in honey and roasted to golden perfection. Roasting the oranges gives the biscotti an even deeper citrus flavor. Find more ways with blood oranges in our January/February 2019 issue! Preheat oven to 400°F (200°C). Line a baking sheet with parchment paper. Cut blood oranges into ⅛-inch-thick slices, discarding seeds. In a medium bowl, toss together oranges and honey. Arrange in a single layer on prepared pan. Bake until edges are just beginning to brown, 20 to 25 minutes, rotating pan once. Let cool completely on wire racks. (Set aside a few slices for garnish, if desired.) Chop into ½-inch pieces. Reduce oven temperature to 325°F (170°C). Line a large baking sheet with parchment paper. In the bowl of a stand mixer fitted with the paddle attachment, beat butter and sugar at medium speed until fluffy, about 2 minutes, stopping to scrape sides of bowl. Add eggs, one at a time, beating well after each addition. Beat in zest and vanilla. In a medium bowl, whisk together flour, baking powder, salt, and cinnamon. With mixer on low speed, gradually add flour mixture to butter mixture, beating until combined. Stir in roasted oranges and hazelnuts. Using lightly floured hands, divide dough in half. Shape each half into a 12x4-inch log. Place logs on prepared pan. Bake until firm to the touch, about 28 minutes. Let cool on pan for 15 minutes. Using a serrated knife, cut logs into ½-inch-thick, slightly diagonal slices. Place slices, cut side down, on baking sheet. Bake for 9 minutes. Turn biscotti over, and bake until dry, about 12 minutes more. Let cool completely on wire racks. In a small microwave-safe bowl, microwave three-fourths of chocolate on medium in 30-second intervals, stirring between each, until melted and smooth. Stir in remaining one-fourth of chocolate until melted. Dip one end of each biscotti in melted chocolate. Place on a lightly greased wire rack, and let stand until set, about 1 hour. Garnish with oranges, if desired.